Mount Gilead first graders are pictured here with their high school math buddies. 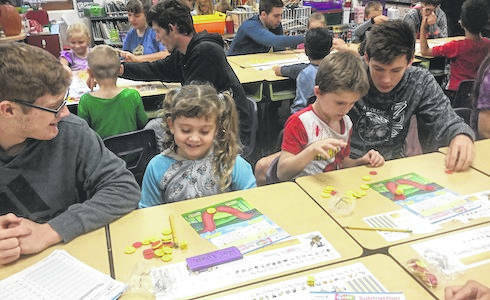 Mount Gilead first-grade teacher Julie Gregory’s students have high school buddies who work with them in math every Thursday. The Mount Gilead High School Big Buddies program has been a favorite for both high school and elementary students for at least 20 years. High School Big Buddies pair up to work with and visit elementary students. It is a great learning experience for both the high school and elementary students, a school news release states.